Acute kidney injury can be caused by problems directly in the kidney, before the kidney or after the kidney. If you think about it that way, it’s much easier to develop a differentiate and establish a treatment. 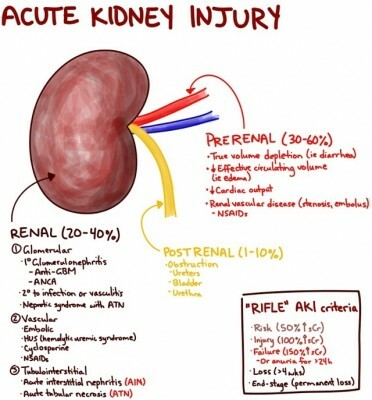 The RIFLE criteria define the relative damage to the kidney and the outcome. RIF = Severity in terms of serum creatinine (sCr), glomerular filtration rate (GFR) and urine production. Though for simplicity I only included serum creatinine since that is most likely what you’ll be looking at on initial blood work. This entry was posted in Emergency, Nephro, Urology and tagged Blood work by Ali. Bookmark the permalink. I plan to use your image in a renal lecture I am giving to new critical care nurses at my hospital. Thank you for posting it. Thanks, this will really help nursing students understand the “prerenal, intrarenal, and postrenal causes of AKI and ARF. Thank you for posting the picture. It really helps me with me lecture. I plan to use your image in a acute renal disorder powerpoint project for my graduate school. Thank you for posting. Thank you for the image. I plan to use it for a lecture for NP students.